Promotes awareness of the purpose and actions of WI SHRM through ongoing communication efforts and branding initiatives using social media tools. Makes sure that HR Professionals, both within and external to SHRM, are fully informed of WI SHRM resources and activities by using existing and developing social media. Works closely with other Council members to ensure that the Council is portraying a consistent and professional image to its members and to the business community at large. 1. Create and facilitate the yearly communication plan with Secretary. 2. Facilitate state and national e-blasts for the Council. 3. Ensure that website content is up-to-date through regular reviews of website and work with all council members to ensure data is kept current on our web site. 4. Assist Secretary with the Council magazine as needed. 5. Assist State Council Director with gathering data to recognize new Council members and exiting Council members, including acknowledgements to their employers for allowing members to volunteer. 6. Assist Partnership Director with Requests For Proposals (RFPs) as needed. 7. Assist other Council members on various special projects and council communication for events, conferences, or activities. 11. Work to educate other WI SHRM council members (and local chapters as needed) about the use of new media, both from a technical perspective and from a business approach. 12. Collaborate with the state conference committee on the strategy for social media promotion. Serves a one-year term beginning the first day of January and ending the last day of December. May be reappointed for two additional one-year terms for a total service of three years. 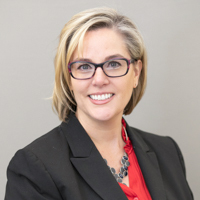 Kyra brings over 20 years of progressive human resources and management experience in multiple industries including healthcare, insurance, nonprofit, and government. She currently holds the position of Senior HR Business Partner with Exact Sciences. Her passion is people, and creating meaningful work experiences by helping organizations build HR infrastructure and strategies that result in fun, inspiring and collaborative business solutions aligned with organizational values. Kyra holds a Bachelor of Arts in Communications from Montana State University, and is currently working towards dual masters degrees in Management and Organizational Leadership through Colorado State University Global. She is certified as a Certified Professional (SHRM-CP) through the Society of Human Resource Management, and a Professional in Human Resources (PHR) through the Human Resources Certification Institute. Kyra previously held the role of Director of SHRM Foundation for the Boulder Area HR Association, and is an active member of SHRM both on the national and local level.